To celebrate its 600,000th piano, Steinway & Sons has unveiled this absolute beaut of an instrument. 'The Fibonacci', as its name suggests features the iconic Fibonacci spiral and is made out of Macassar Ebony. It was designed by Frank Pollaro. The piano was unveiled to mark the company's 600,000th piano and designed by Frank Pollaro. The piano was handcrafted from Macassar ebony. The iconic spiral is made from six individual logs of Macassar ebony, which, the company says, aims to '"epresent the geometric harmony found in nature"
The 'Fibonacci' is a Steinway Model D piano – a nine-foot concert grand. The beautiful piano has been priced at $2.4 million. The piano also has synthetic ivory inlay and bronze details. Steinway's 100,000th piano was given to the White House and is now housed at the Smithsonian Institute in Washington D.C. The piano took 6,000 hours of work to make, over a four-year period. The piano's designer said: "As I considered the number 600,000, the Fibonacci spiral came to mind." 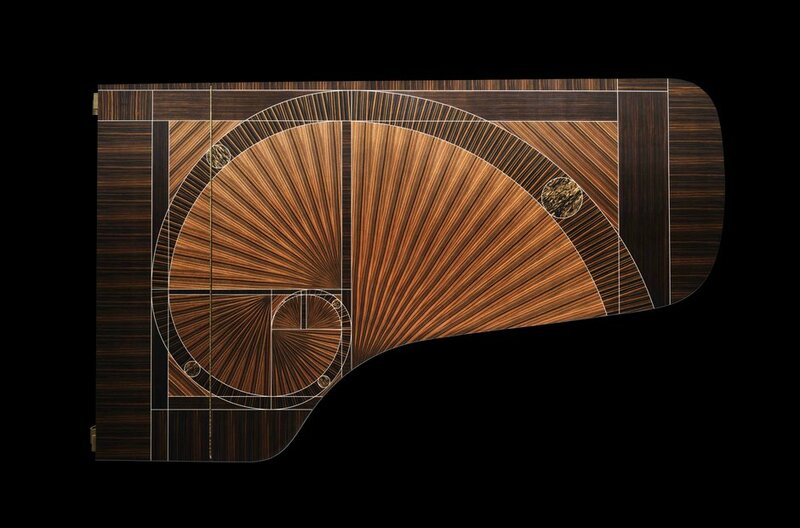 A spokeman for Steinway said: "The Fibonacci spiral is a representation of perfect proportions and natural beauty. Without a doubt, Frank captured those qualities in this piano, creating a work of art for the eyes and the ears." The piano bears the signature of Frank Pollaro, who designed it. The piano is currently on display at the Masterpiece London art fair. 14. "On honour and a challenge"
The piano's designer, Frank Pollaro, said: "Designing Steinway & Sons' 600,000th piano was an honour and a challenge. To me, knowing that this piano would become part of history meant that it had to be more than just a beautiful design." That mesmerising spiral can be seen on the underside of the piano lid too.